Surat al-Waqi`ah is one of the most beloved and most recited Suras of the Qur’an. This is because of the sense of urgency and opportunity it conveys. 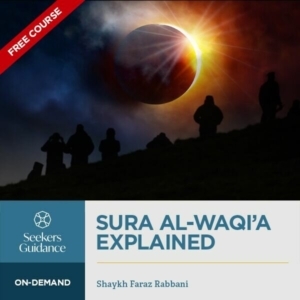 In this course, Shaykh Faraz Rabbani covers a thematic study of Sura al-Waqi’a, a close explanation (tafsir) of it, and key lessons that can be drawn from it. The course also examines how to nurture one’s relationship with Allah through deepening one’s understanding and relationship with this great Sura. – have a good understanding of the virtues of this sura. – gain practical advice on why the recital of this sura and other suras like it on a regular basis.